Pain, loss of strength or sensory changes in the distribution of the median or ulnar nerves but not associated with neck pain. 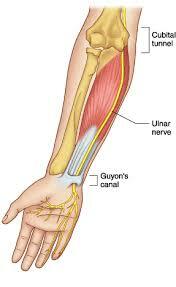 History and physical examination for neuropathy entrapment. Plain radiographs are not required. Take tablet or capsule forms of these medicines with a full glass (8 ounces) of water. Do not lie down for about 15 to 30 minutes after taking the medicine. This helps to prevent irritation that may lead to trouble in swallowing. To lessen stomach upset, these medicines should be taken with food or an antacid for neuropathy entrapment. For Carpal Tunnel Syndrome symptoms prescribe a volar wrist splint to wear at night and during the day (take splint off every 2 hours and move wrist to prevent stiffness). Also avoid activities that promote symptoms. 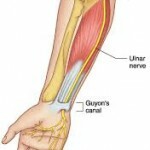 For cubital tunnel syndrome, educate the patient to avoid pressure on elbow and to avoid activities that increase symptoms. Refer to Occupational Therapy for night elbow splints. Expect Resolution or decreasing symptoms within three to four weeks. Defects or impairments that require significant restriction of use due to neuropathy entrapment. Motor vehicle driving only with splint and with caution for neuropathy entrapment.